Ostravsky Konik International Chess Festival 2014 took place from 26th April to 4th May 2014 at the Social Hall of Culture House in Ostrava, the third largest city in the Czech Republic. GM David Navara takes the national trophy, winning the Czech Championship with 8/9 points, 1,5 points ahead of the nearest followers. Second place is shared in a 4-way tie by IM Richard Biolek, GM Martin Petr, GM Tomas Oral and GM Jiri Stocek with 6.5/9 points each. 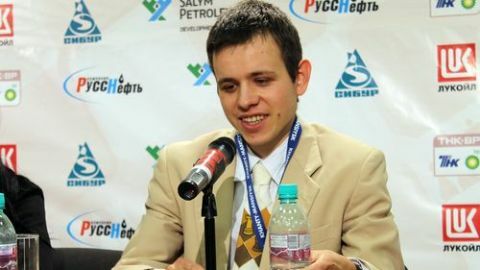 Oskar Hajek is the winner of FIDE Open “B” with 7.5/9 points. Emil Matsura is the best veteran with 7.5/9 points. GM Peter Michalík from Slovakia shares first place in the blitz tournament with IM Vojtech Zwardon with 9.5/11 points each. The team Piat – Jelinek takes the gold with 12 points, leaving the runner-up a full point behind. Martin Nehyba proves to be the best child in rapid, finishing with 6.5/7 points. You can see the standings in each group below. More information here or at the official website.